Our skilled team can match and create specialist mouldings that are either specially commissioned, or generally modelled on existing features. Existing plaster and stone mouldings can be reproduced using contemporary methods of design. We team this with traditional methods of craftsmanship. 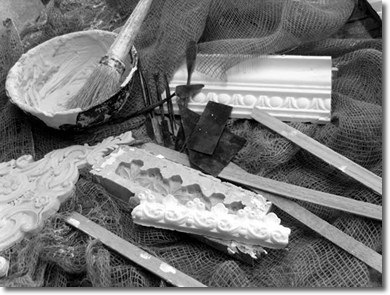 Through the use of fibrous plaster, we can mould items to accurately match customer's specifications. We can also use our talents to adapt new plaster mouldings to match the style of the existing ones. This means we can create new products that perfectly match the existing ones; an ideal option should there be pieces missing. Our team are always attentive to clients needs, and take care in their roles. They will ensure that your property is cared for, should we be appointed to install our produced items.